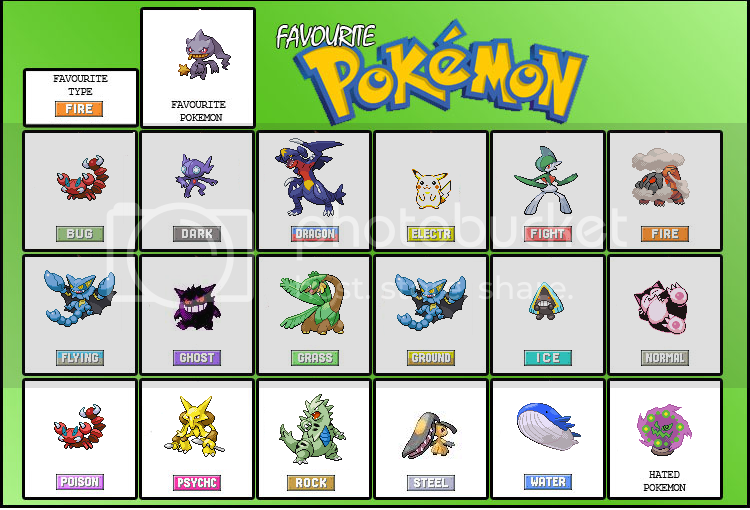 Since we've had like 6 pokemon topics, I figured I'd make a single one for all Pokemon-related topics. And to kick-start things, here's a favorite pokemon sheet. Erase my ****, fill it out and post it. This took way too long to make. Also, when I put the shiny, it's my favorite as a shiny only. I'm sad to say that my DS is borked, so now I cant play Platinum or HG/SS without one of them fancy DS emulator majiggers. I have Emroowd on an emulator though, so not all is lost. I just traded my copy of MKDS for Emerald. Been playing it on my little TV while watchin' **** on my big TV, **** is so cash. forget it, it all takes too long. Just throw the games' fire-type starters where applicable, Pikachu as electric, and Typhlosion as favorite. I don't think there are any Ghost types that aren't awesome, except for Rotom. YOU GUYS KNOW WHAT WE NEED? A WASHING MACHINE POKEMON. Spiritomb is also pretty ****ing stupid. 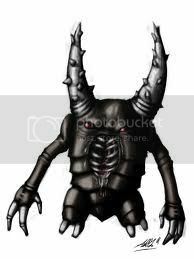 The only Dark/Ghost pokemon should be Sableye. Spiritomb should be Ghost/Rock. Yes, I am incredibly mad that Spiritomb is one of the hardest to defeat Pokeymans in the game. In generation news, Generation 3 gave me constant orgasms. Generation 2 was far better because it introduced Eevee, the cutest goddamn pokeman ever! Oh, sorry, misread Peri's post. Whatever. I'll just sit here saying generation 1 was the best and all these newfangled ones look like robot plushies. Except for the silly ones, like the Easter Island head with a giant nose and the pineapple duck. I'm cool with those guys. I had best not hear anyone talking **** about pineapple duck. eh, pineapple duck is alright, doesn't taste to good on pizza though. But I'm training for the E4 in Sapphire right now. After that, I'll get Platinum. Yeah it is. But the question is... Is it FORWARDS COMPATIBLE? EDIT: Darn you Skybluefox! MESSING UP MY REPLY BY NINJA-ING ME AND MAKING ME LOOK SILLY! DAARN YOUU!!! I haven't played a Pokemon game since Crystal, but I just got HeartGold. Going to play it now. 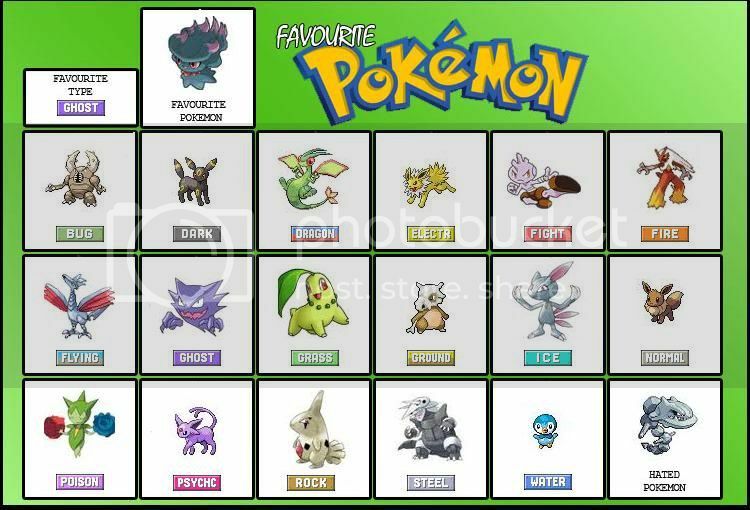 Maybe I'll fill out that favorite Pokemon sheet when I get reacquainted with them. My favorite pokemon is Lotad and Water pokemon are my favourite types! Coal is inefficient. I only use Propane and Propane Accessories.